Ten Pinterest tips from a user with 1.2 million followers: Me! The number of followers on my Paper PC Picks hot products board on Pinterest now rivals that of major tech websites such as Mashable and The Verge. I don’t like to toot my own horn, but I’m quite proud of the CNET story on how I amassed 1.2 million followers on Pinterest. My Paper PC Picks board on Pinterest has proven to be an excellent vehicle for quickly posting short stories on new gadgets that I see at press conferences and trade shows. 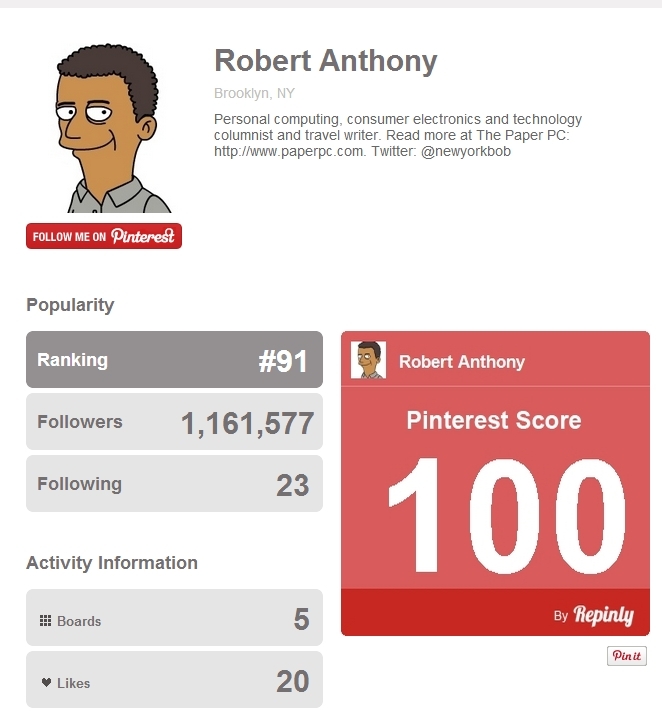 According to Repinly, I’m now one of the most popular Pinterest pinners in the world. I only have you, the readers, to thank for that. Click here to read the CNET piece. And thanks for your support. This entry was posted in Uncategorized and tagged followers, gadgets, newyorkbob, Paper PC Picks, Pinterest, rankings, Repinly, social media, social networking, technology, The Paper PC. Bookmark the permalink.